I hate to admit how long it took me to clean my office over the weekend, but let’s just say it was way, way overdue. The result, however, made me so happy this morning when I finally sat down at my desk. In addition to cleaning and decluttering, I reorganized and primed and painted an old bookshelf that now beautifully displays some of my favorite photographs, books and magazines. Among the stored items I uncovered was this large pine cone that Cam had collected one winter while we were on a hike. Once again, it took its place as part of the centerpiece on our dining room table now that all of the books, boxes and the printer have been relocated to their appropriate places. 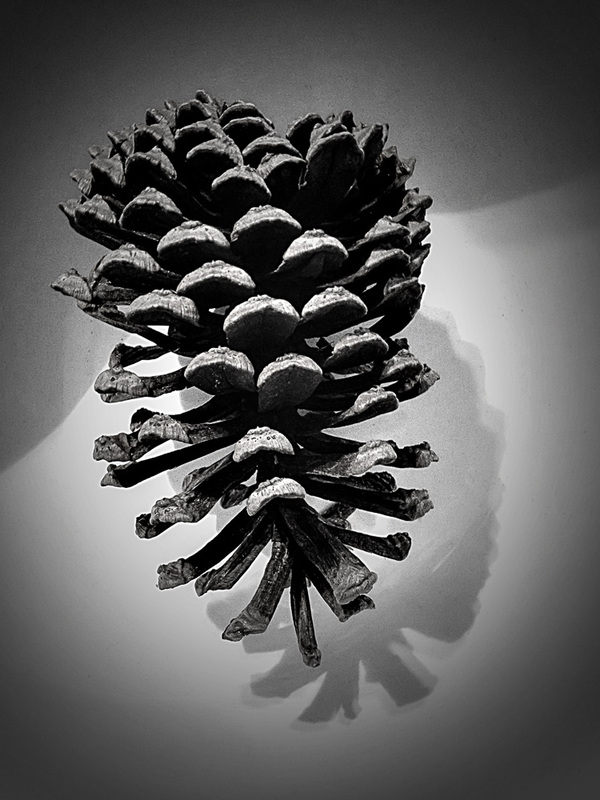 I snapped a photo of the pine cone yesterday using the Dramatic Black And White app. I’m not sure why chaos and clutter always seem to rule the day, but in our house it’s a continuous fight. I hope that this time the beautiful symmetry of the pine cone on display will rub off on us and keep everything in its place…well, at least for a few weeks! Yes it is a dramatic and satisfying change and will hopefully remain this way for some time! Thanks!